It is the time of dark. Within the mirrors of the Babylonian towers rest the Terhyatyin Djinnh, (spawned in the lakes of fire), carefully whispering the answers their masters long to hear. "Who is the wisest in the land?" the old men ask. "My lords," reply the Djinnh, as they fold their wings against their tough and leathered backs, "you, the Medians.... are the wisest in all the many lands." The old men are not to be comforted. "Need we look farther?" they whine. "Are we truly all knowing?.... How do we explain the quazars?.... What lies beyond the X-ray sources?" With oiled tongues the Djinnh respond, soothing with old lies.... these fevered minds who have stitched an artificial universe from the whole cloth of limitation. "Have you no answers?" the old men shout.... but the Djinnh are no longer listening. They are dreaming now of the ziggurats.... of jade and gold.... in Phanyaz, Epharia, Nahabaden and Ziir.... when they, the Djinnh, were called the First Born.... and all was new. The questions of these lesser ones were different then, but the faces were the same, vision-clouded as before. Answers are demanded now.... the answers must be given.... so in weariness they reply, You need look no farther. Your word is the law that no one may doubt.... unless they seek exile!. The astronomers depart. Silence falls in shadowed folds. All is sleep (From the Books of Ebonhad the Beholder: Linhesh Solflower Dynasty). NOTE: The Djinns name, is Traje-Mikzozamaka-Kal (Tra-Jay-Meek-Zoz-Amaka-Kal). If you wish to contact him be warned: he will never harm you in any way but he can become quite testy if he does not find your questions intriguing. Ask him to tell you about himself. The automatic writing method is recommended; memory cannot always be trusted. "VOICE OF LOVE" AND "CENTER OF LIFE"
Her sparkling opalescent auric field, swirling, mist-like, extending for miles to all sides is the pure White Light of Timeless Love. 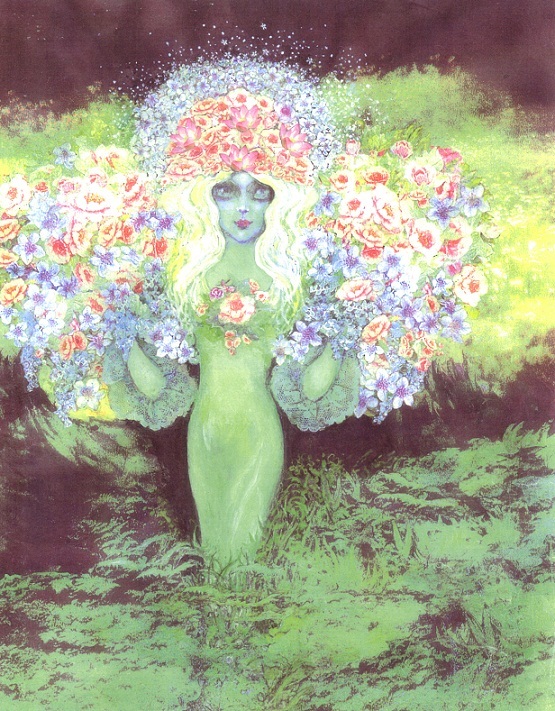 As she moves through the wild, sweet meadowlands and orchidwood forests carpeted with violets and dragon-fern moss, acknowledging the tiny bell song greetings from all around her, everywhere, it is clear that this exquisite , glowing Elemental Queen would not be here at all if Venus were the blazing hell- world it is thought to be. When her portrait was painted in 1982, I was surprised to see that her surroundings were so lush and beautiful, but I asked no questions at that time. I did, however learn from her something of inestimable value. After Maa-terannhs portrait was finished, she told me Venus is a beautiful high frequency world full of vibrant life with solar human, non-humanoid and elemental populations. Even now I clearly remember her statement, but back in 1982 I was just beginning the portrait cycle and could not stop to talk because the images of important entities were coming through so quickly, each one timed to be painted during a specific window of opportunity in an exact sequence. If I were to miss any of those windows, the image frequency would be withdrawn and, most likely, not be retrievable. Back in 1962 it had been widely reported that information sent back from the U.S. space probe Mariner 2, bypassing Venus at 26,600 miles, showed the surface to be fiercely hot. Then in 1969, two Soviet probes sent back signals during parachute descent through the atmosphere of Venus indicating that the conditions on the surface were so intolerably hot that only lower life forms might survive. The astronomer Patrick Moore, in his book The Atlas of the Universe, commented that as a potential colony, Venus had proved to be a disappointment. It was this general view of science and the military that saved Venus from colonization. At least, it appeared to be the reason. The truth about Venus was beyond their ability to grasp and would remain so. Years passed and the work continued unabated. It was in the mid-nineties when I received the major clue concerning Maa-Terannhs statement. I was reading The Secret Life Of Plants, by Tompkins and Bird when I came to the story of T. Galen Hieronymous and his wife Louise and their experiments with plant communication, bringing the world, as they did, a level of truth as to how and why Universal Energy functions as it does, findings usually impossible to obtain. During the 1940s, T. Galen Hieronymous, an electrical engineer, and his wife Louise began researching radionic / psionic effects upon plant life. He discovered a mysterious type of energy (travelling along with the sunlight) which produces chlorophyll in plants. He named it eloptic energy. He then found that, unlike sunlight, it was transmittable through wires. At first, he did not know where this energy could be located in the electromagnetic spectrum, but finally realized that this strange and powerful radiation was not really connected with the spectrum but was completely separate.... and unique. Curious to find out if this eloptic energy, seemingly similar to some type of radio frequency which could travel with solar radiation but, unlike solar radiation, was transmittable along wires, could possibly be utilized as a carrier beam, sending signals or information from nearby planets to Earth. He placed a ten power telescope on the roof of his home. After focussing it on Venus, he removed the telescopes eyepiece and installed a metal disc with a hole at its center and a wire soldered to its edge which carried this eloptic energy down into the house to the radionic equipment operated by his wife Louise. She then began running tests similar to the early ones they had made measuring the vitality of the human body and the internal organs to find out if any of the thirty-five wavelengths produced by the human body and its internal organs would be replicated by those coming through from Venus. At least half of the thirty-five wavelengths they began receiving were coming in directly from the Venusian surface, but only half. The others did not appear. The Hieronymuses then realized that they must be receiving a life force energy (through the eloptic carrier beam), not from human or animal life forms, but from parts of Venusian plant life and that the vitality measured was twice that of earthly flora they had tested. Most astounding was that the readings clearly showed that the Venusian plants appeared to have aetheric / physical forms. Well, why not? Venus, our glorious sister planet IS an aetheric / physical planet.... as Earth Harmona soon shall be. No boiling deserts there, of that you can be certain. Maa-Terannh was telling the truth. What a divine confirmation that was! Venus possesses a very large, advanced Solar Human population and powerful Venusian and Extraterrestrial fleets based in the northern regions of the planet. The Peoples of the Nature Kingdoms live in harmony with their Solar Human equivalents and the Extraterrestrials stationed there. In the book Flying Saucers have landed, by Desmond Leslie and George Adamski, it is stated that most of the ships seen in our skies come from two neighbors, Mars and Venus, particularly Venus. One of Adamskis most important contacts, Dr. Meade Layne and his UFO research group (in San Diego) composed of scientists, engineers and students of the ancient wisdom.... have dwelt at some length on the probability that life on Venus takes place on a higher octave of matter than on Earth; in other words, at a higher vibratory rate. By reducing this vibratory rate to the same rate as earthly gasses, liquids and solids the Venusians are able to appear in solid or semi-solid form. Their technology allows them to travel throughout the Cosmos. Adamski, Layne and Hieronymous all agree that Venus is aetheric / physical. Assuming that Venus truly is a beautiful inhabited world, not a scorched burning wasteland, was there some form of advanced cloaking technology at work, surrounding the planet with a giant encircling image of desolation, together with wind storm sound effects to shield and protect this ancient world and her peoples from invasion and colonization.... or at least appear to have saved it? In fact there was a deeper and more powerful source technology that screened the real Venus from view, which will be revealed in the Shaelh Englana text. Somewhere between late September and early October of 2007, close to midnight, I found myself rising suddenly from my desk and switching on the radio. I tuned in to Coast to Coast, the now famous, greatly respected late night talk show with more than twelve million U.S. listeners and many more around the world (via the internet). At the exact moment the sound came on, a voice announced that an unmanned American space probe orbiting Venus (quite recently), had photographed during a short break in the cloud cover, a group of seven large round domed buildings on the surface. at that point (after ten to twelve seconds), the conversation shifted to some other topic and I turned off the radio, going back to my desk in a state of euphoria.... to put it mildly. In late November of 2007, once again on the program Coast to Coast, Richard C. Hoagland, a science researcher formerly with NASA and well known for his work in decyphering Martian anomalies, stated during a discussion of Americas space program that he is convinced that NASA (now heavily militarized) has two ongoing programs; one highly visible using rocket propulsion, and the other classified secret utilizing back-engineered recovered extraterrestrial spacecraft. He did not mention whether or not they were piloted by humans or extraterrestrials but I suspect that both are involved. The final confirmation that, for me formed the big picture of covert activity had actually been revealed many years ago when David John Oates, a reverse speech expert, a special guest on Coast to Coast (then hosted by Art Bell), played an audio tape of communications between mission control (Houston) and amazingly, one or more crew members orbiting Venus in what would have had to have been a space vehicle. The voice on the tape was quite garbled and backed by other less audible voices. First of all he played the tape as it would normally be played and then a second version played backward. The message now came through much more clearly; the speaker was saying that there were shielded ships nearby. Then.... the sound of static, followed by the Americans.... that was it. At the time I heard this I was determined to remember it, but now I must go further. I can only conclude that the speaker was not an American but part of an international team from one or more Western nations cooperating with NASA, all of them bent upon the eventual colonization of Venus. They will never succeed however, because the much older spiritually and technologically advanced systems will not permit Venus to be colonized by hordes of uniformed mentally challenged opportunists. Sounds Harsh? Well, just look at whats been done to this planet! 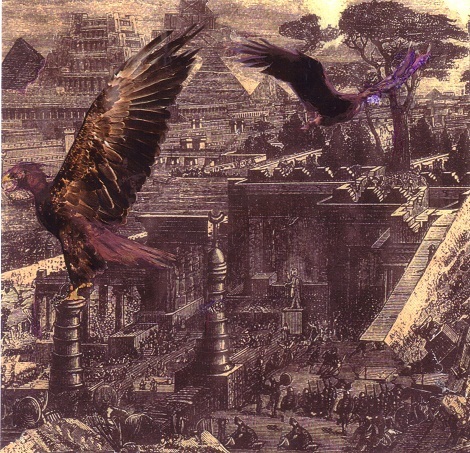 In his official portrait, Lord Ymanko is seen in one of Neptunes great forests, kneeling behind an enormous, most glorious naturally formed sapphire that acts as a receiver of images and messages from distant realms, pulsing with the psionic energy of a large carrier beam which allows for the lightning quick arrival of his great Spirit Birds, beloved companions seen here resting within the Sacred Gem. They fly with him on all his journeys, always returning to their sapphire roost. If the carrier beam is operating to bring home Ymanko and his sacred birds, or if visitors are expected, the great gem will lose its hardness, becoming a transparent, deep blue fragment of night filled with stars.... In the background is the ocean entrance to one of Neptunes vast crystalline cavern systems. On a high mossy bank just above the ocean inlet, a newly hatched baby dragon enjoys her first sunbath but will soon swim back to dry land in the caverns where her mothers nest, with five other hatchlings, is located. The large snowy white mother dragon is out in the forest gathering ripe fruit, flowers and sweet roots which she will carry back in her mouth to feed the hatchlings. Many trips back and forth are needed to satisfy her glowing little brood with their fiery opaline eyes.... stretched out and dozing, each one on its own shelf, one of many sapphire gemstone plates that emerge from the crystalline walls, backlit from some distant source deep within this sparkling citadel of the White Dragon. There are no carnivores in these high Nature Kingdoms. The frequencies are too intense to allow for the taking of any life. Crouching to the right and to the left of Ymanko are three very unusual, strange plant devic elementals of the Ulah evolution. The closest one can come to a reasonably accurate description.... or better still an analysis, of what they are would be that they are plant form entities created in the unimaginably ancient stars of Arcturus.... by some great scientist possessing utterly pure crystalline intellect.... to act as monitor / guardians in an extensive complex of greenhouses. This powerful entity is also of the mineral / plant evolution. As I write this, I see a very peculiar, quite startling scene: a tall spidery form.... very large head with pronounced frontal lobes.... supremely gentle, expressive pale green eyes.... and a kindly smile, quite unexpected considering this entity is of an origin remote from both humanoid, and non-humanoid. This obviously very old personage, at rest in a shadowed room of alien design, his long thin limbs stretched out like jointed spider legs as he reclines on a large, delicate throne of intricately woven golden wire, glows with an internal light, a puzzling yet profoundly moving sight. This is the source of the little entities in Ymankos portrait. Perched high within the leaves of a dwarf magnolia tree behind Ymanko are two Neptunian Owls who are the guardians of all wooded places in this vast world of Neptune. There are always several owls in attendance when Ymanko is home. However, though Ymanko is dearly loved by both brown and white birds of this Neptunian species, they are homebodies and do not like long journeys. They are forest monitors, not travelers. Lord Ymanko and his beautiful wife, Queen Shaelh Englanna, are the rulers of Leprechaun peoples of our local Galaxy. Their home world (during this cycle) has been Neptune, but they also have two homes here on Earth; in the enormous crystal cavern systems deep in the interior of the Pyrenees mountains between France and Spain (on the French side), and within the Transylvanian Alps in Rumania . The awesome worlds of the Leprechaun are home to many millions of these ancient entities both male and female, legendary alchemists known as builders of form. Ymanko, Shaelh and their klans originally came from the magnificent and very, very old star system Cygnus, The Swan. 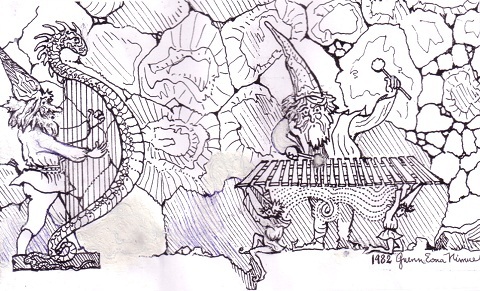 Shaelh and Ymanko call Kooshakolhos Crystal Palace their special place, for they are old friends to both Kooshakolho and Paa-trolle-um. They are also very close to Rhinn Raz Djinnh, the great Djinnh Lord who monitors the high aethers above Stonehenge, which, as you may recall, lies directly above Kooshakolhos Crystalline Kingdom. Elemental beings like Lord Ymanko, always unfailingly kind and gentle, are now on hand to assist all advanced spirits on their journey twards wholeness and perfection. He and his beloved soul-mate wife Shaelh rule their Leprechaun Kingdom.on Neptune and Earth, with firmness and love. At the beginning of this Ymanko text it was stated that Ymanko and his soul-mate wife Shaelh possess two crystalline cavern homes on this planet: the first is in the Pyrenees mountains deep below the surface of its tallest peaks. There are stairwells everywhere which lead to all the craggy summits throughout the system where the top most interiors have been transformed into marble / crystal walled lookout stations. The Pyrenees form a natural border between France and Spain. The view from these mountain top watchtowers is breathtaking. These immense chambers.... shadowed and quiet.... draw endless streams of small visitors, enjoying some down time away from the busy kingdom far below. On one side is France and on the other.... Spain. Their second home (in Rumania ), is in the Transylvanian Alps. Its interior is of similar design to all the other elemental strongholds built below the major Dragon-path / Ley-line power points and conjunctions. There are the high ceilinged Great Halls, a veritable spider web of twisting passages and a literal honeycomb of work rooms, apartments and miniature smoke stained kitchens. For these little people, Rumania remains their Land Beyond the Forest. 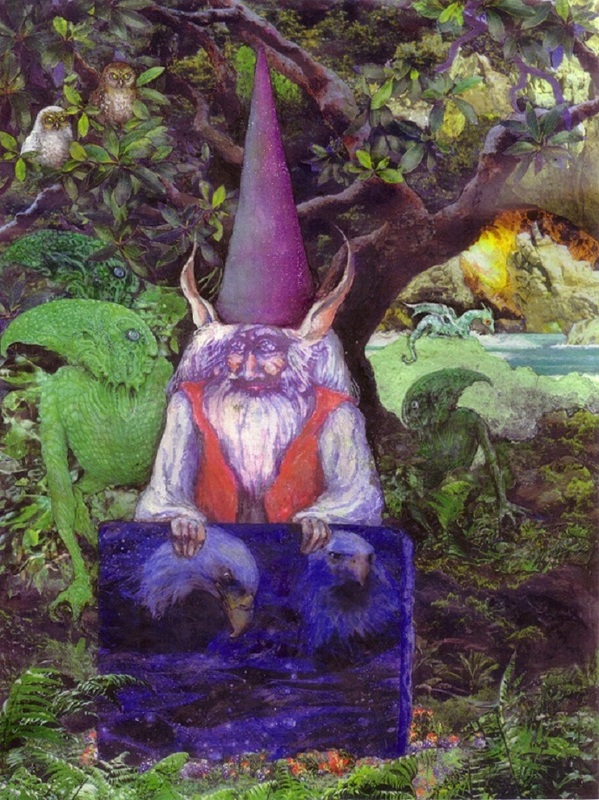 The capricious Leprechaun has been described as a solitary Faerie shoemaker. Wrinkled, wizened, with a scraggly beard and spectacles on the end of his long nose, wearing dun-colored clothes and a leather apron, dilligently tic-tacking with his tiny hammer, endlessly, obsessively working on a single shoe.... Solitary elementals trapped in the outer world and far away from their klans and tribes, often because they have been cast out, will become two dimensional and mischievous, filled with trickery. 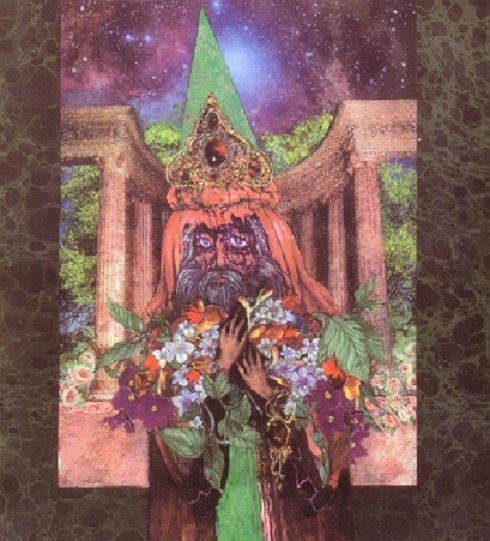 Away from the surface.... and human influence, they remain both noble in nature and immensely creative in many fields: Herbal medicine, and the designing and weaving of magnificent tapestries that gloriously illuminate Leprechaun history. They are fond of their music and all of life revolves around it. There are entire families of musicians who have always lived in the Pyrenees and Transylvanian cavern systems. Their enchanting songs, melodic chorales, charming ditties and country stomp dance tunes will echo through the halls and passage ways, bouncing off the high rock crystal walls. The silvery chords drift out through well hidden openings into the night wind and twinkling world of stars and village lights, often causing a certain amount of consternation when people hearing the faint ghostly sounds will conclude they have imagined them. 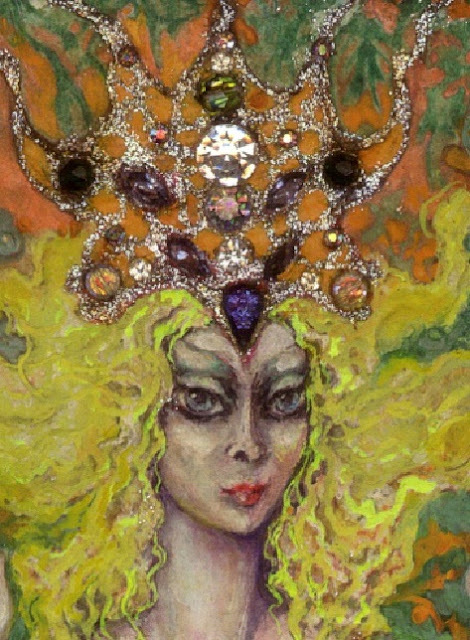 Seen here in one of her vast forest lands for which Neptune is famous, wearing a breastplate of elemental rubies, diamonds and opal in settings of Neptunian white gold alloy, which, if fashioned in a three dimensional environment would be far to heavy to wear, but here in this high frequency world, there is no problem with gravitational pull. 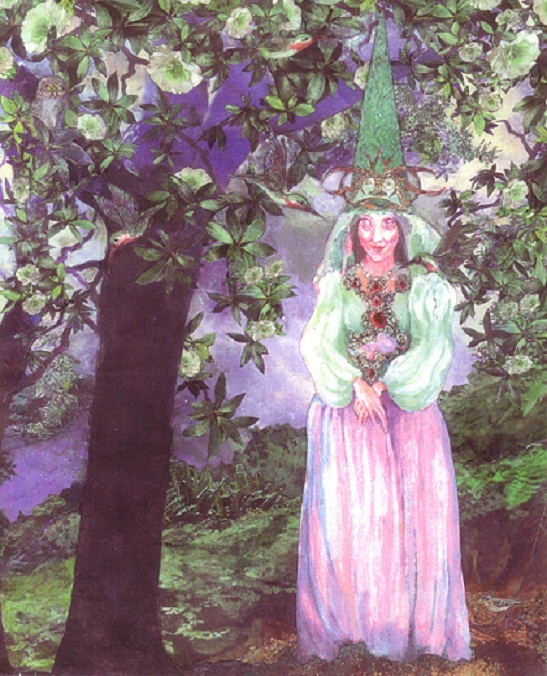 The trees around her are Neptunian magnolias. As she walks through her ever flowering woods, she is always accompanied by her four tiny hummingbird companions. At this moment one of them sits on her shoulder. On the ground to her left, a small Thrush spirit observes the scene. In the tree on her left, another spirit bird watches over her. High up in the leaves above her sits a guardian Owl. She is the protector of the Wild Swan, Wild Goose, Wild Duck, Heron, Crane Flamingo, Ibis, Nightingale, Lark, Hummingbird, Robin, Thrush, Flycatcher, Roc, Seagull, Albatross, Finch, Morning Dove, Wren, Bluebird, Cardinal, Woodpecker, Cormorant, Penguin, Mud Hen, Bird of Paradise, Rose Parot.... and the Great White Deer. 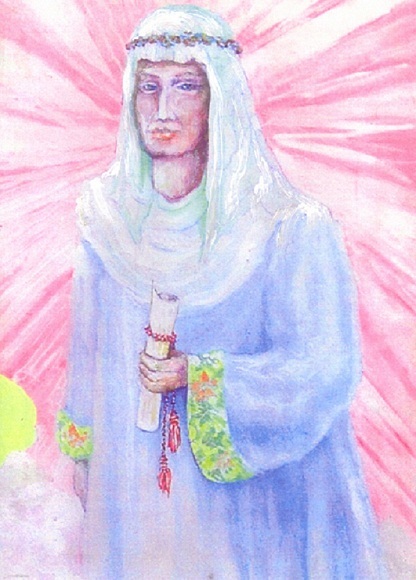 The Maitreyan Shaelh Englanna comes from an ancient Angel lineage and brings to this planet the Life Streams of Wisdom to transform all here into light form. Her origins lie in the stars of Cygnus, The Swan, a truly magnificent, very, very old system of twenty large stars and thousands of smaller ones, most of them with inhabited orbiting planets. These worlds are rich in elemental life. All the Leprechaun peoples come from Cygnus. Many of them became great explorers, leading expeditions to the far reaches of the greater universe, and eventually created new kingdoms (like the one on Neptune). Sometimes when manifesting in physical form, they would travel aboard the Lightships, but as elementals it has always been much faster to simply beam in to ones destination. Shaelhs and Ymankos home-world, Neptune, is sixth dimensional, an aetheric / physical planet seventeen times larger than the Earth, with many shallow, sparkling fresh water oceans and hundreds of small heavily forested mountainous land masses. In the glorious shadowed woodlands there are numerous enchanting Le-Prehkhan villages known for their tall needle-spired towers. Neptune ishome to many races of immensely evolved elemental beings. 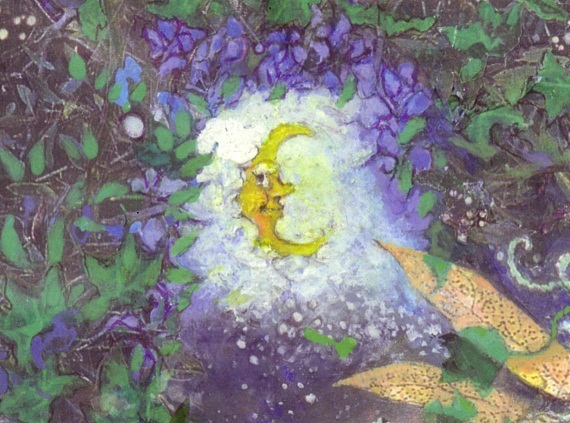 In Earth legends, Neptune was the planet of dreams, both mystical and obscure. In fact, Neptune is a very real Faerie Tale world populated by elemental beings who transform dreams, giving them substance and life. They design new animal and plant forms and, like painters working with mixed medium, they combine elements of unrelated species to create new, exotic life forms such as the Platypus, Hornbill, Lemur, Seahorse and Pelican. The Leprechauns are the Bird People, the ones who, in origin, created the bird thought-form and will often shift to the bird form when working with the Bird Elves. They also assisted in the development of the giant White Deer, a species of herbivorous mountain lion, the seahorse, a tiny species of blue-grey rabbit, and many colorful, exotic, aquatic life forms. The enormous snow white dragons of Neptune who live in the shoreline caverns appear to have been self created. NOTE: The sharp eyed reader will see that there is one very strange, out-of-place bird on Shaelhs protected bird list, at the beginning of this text: the Roc.... an enormous, mythical, fifth dimensional eagle, A Law Unto Itself, immortalized in Arabian adventure books and movies and quite often.... companion to the Djinnh. The ancient peoples lived in fear of the Roc. When in the primitive, brutal dimensions of those times the Roc became an ugly natured bird, preferring human prey, but within the elemental dimensions, however, the Roc becomes the gentle, nurturing Mother Hen, ferrying the small folks from place to place. The stars of Cygnus have become legendary for their swans, very large birds with a twelve to fourteenfootwing span who live in the lake districts of nearly every planet in the system, whether inhabited or not. Most of them are bright milky white with orange-gold beaks tinged with black, but there is also an older archetypal variant of pale leaf green with dark-bluish ribbon-like markings that begin at the top of the upper beak, curling up over the head and down the backs of their great curving thickly feathered necks, leading toward the wingtips and tail. These variant swans are truly spectacular, not only for their size, but in their character. They are particularly gentle and infinitely patient with the Angel Spirit children, carrying them on long flights across the meadows and woods almost every day. You can see these tiny aviators, their plump little legs hidden deep around the thickly feathered necks and holding on for dear life, laughing and waving at each other as they joyously fly off into the deep blue sky on a glorious, flower scented Cygnus morning. The large planet Cygyannuus, a Thousand Swans, is Shaelh Englannashome-world where her spirit mother and spirit father still live.... to this day. It is a world of Angel communities. All the homes are manifested of pale rose marble, and the high outer walls are adorned with wondrous carved bas-relief scenes depicting the Adventures of the Spirit that the occupants have experienced. This old custom of carving scenes of Angel life upon the outer walls of the family home was developed as a fine method of recording the parents Masterwork.... forever. Earth's "stars" of astronomical studies would have you believe that Neptune's bright bluish coloration is due to traces of methanein the atmosphere largely composed of hydrogen and helium. It is presumed that Neptune's bluish coloring is so much more vivid than that of Uranus (which has a similar percentage of methane), there must be some unknown component that causes the intensecolor of Neptune's surface. Some unknown component? There certainly is an unknown component, but not one which could be understood or duplicated by Earth science (in its current state of development). The bright bluish surface of Neptune is not a natural phenomenon but instead a protective cloaking produced by very old star technology, Psi-Field-Ray management. The ships especially designed for this work are called Technology Centres. These ships are absolutely enormous, sometimes as large as planets, equipped with very advanced hardware, and are similar to the mighty space ships that can alter the orbits of planets with giant levitating beams (as described in Joseph Caters book Awesome Force). 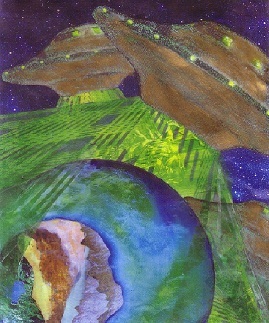 The illustration (above) shows three Universal Legion Technology Centre Mother ships (the third only partly visible at the lower right) creating veil of illusion holograms as protection against hostile takeover. There can be as many as six panoramic shields to confuse and intimidate illegal trespassers. The holograms are very realistic: frightful winds, terrible storms and vast desolation. Just over 500,000,000 years ago the Great Guides had removed the elemental nucleic energy from all universal sectres. This following text deals with the developing crisis (beginning in that time period), when negatives from our own system, the Pleiades, and others from neighboring stars entered this sectre on a mission of conquest. They intended to invade and take control of Jupiter, Venus, Neptune, Saturn, Mars, Uranus, Mercury and Earth Harmona. This is the story of how those criminal adepts were finally foiled in their attempt to conquer and enslave the peoples of this galaxy. When they learned of the approaching danger, the Old Ones knew they would have to seek outside help.... and very quickly. So it was that the peoples of these six beautiful planets joined forces with the Venusian and Neptunian Adjutant Fleets, with added assistance from the Universal Legions who possessed the most advanced energy use technologies, creating giant psionic field holograms (veils of illusion) to protect them, enveloping all six planets with panoramic images of parched blazing hot deserts, waterless ocean beds (for Venus and Mercury) and storm lashed gas giant imagery for Jupiter, Saturn, Neptune and Uranus. All pure illusion, of course, but effective enough down through many millions of years to discourage any and all extraterrestrial colonizers in their silver scout ships, now quite often back engineered and piloted by highly trained human military pilots.... from any thoughts of further investigation. There were two planets that could not be saved. They successfully conquered Mars and Earth Harmona because the people of both planets, due to pride and overconfidence, refused assistance from the Universal Legions and were overwhelmed in short order. The following illustration is of Star Mistress Heraldeh Maas, Draconis Fleets (home-world: Lynx Systems), a member of the combined forces that spearheaded this massive rescue mission. Her (all female) lightship unit is known as the Sisters of the Sun. Her specialty is study of the mind. Psychiatry, known to her people as Mind Probe Radiant Alternatives, is quite advanced and highly effective. She is of the Elvish Evolution. Please note the enormous Mother Ship partially obscured by the clouds in the distance. Prior to that time, Mars was a serene and exquisitely beautiful water-world with great crystalline bridges connecting all land masses. In the past several years, through close study of NASA photos of the Martian surface, Science has concluded that the planet did, millions of years ago, possess large oceans and waterways. Close examination also reveals numerous tiny, dark, pyramid shaped shadows, definitely not naturally formed. The enormous Face on Mars was created by the negatives to inspire fear in all who entered Martian space. Those of the Elemental Kingdoms in this sectre watched with horror as human evolutionary progress came to a halt when finally the Atzlan Extraterrestrials gained control of the entire planet. When Earth Harmona became a prison world, our Nature Monitors would not allow these monstrous invaders to defile and destroy their homelands. They closed off their dimensional portals and Faerie Pathways to all surface life, placing mighty Dragon Guardians along the borders of all their elemental realms to put an end to any thought of takeover. Here are a few last thoughts concerning the advanced technological process utilized to psionically shield planets from invasion. Though perfectly understandable that most will not believe this to be possible (mentally indigestible data), be it also true that its a bit late in the day to remain in denial. Millions have seen the inter-dimensional Lightships, some of them absolutely capable of travelling at thousands of times the speed of light, passing directly through mountains, rising from the waters of the Great Lakes (in the northeastern United States) and shooting off into the night skies. They have been sighted where the oceans are deepest, knifing down through the surface, most likely heading for one of the well established underwater bases.... of there are many. 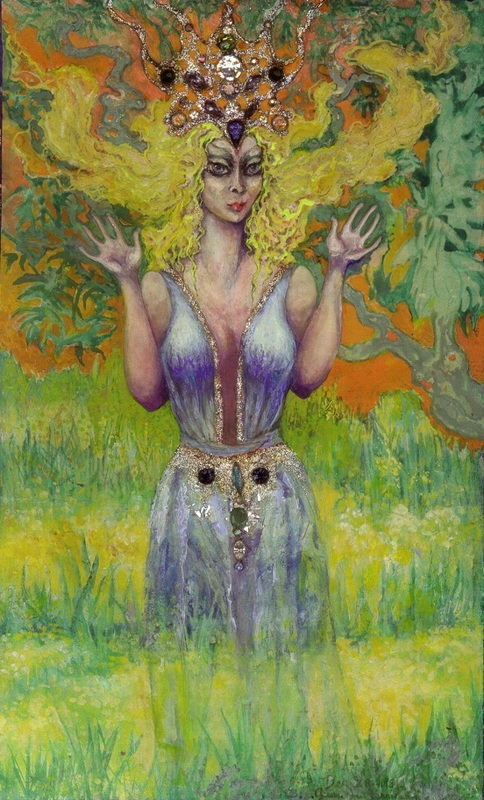 "OUR LADY OF THE FLOWERS"
During Jupiters origin cycle, the Star People, resonating as they did with the far more subtle, awesome frequencies of their home-worlds, created their Light Centres, large communities of scientists, philosophers, artists, poets musicians, and a whole host of artisans. In those times there were no barriers between humans and the elemental peoples. Many wonderful friendships were formed and more than a few love matches.... between these solar humans and their elemental counterparts. Long before the solar colonists came to Jupiter, Suwaraelaz and her peoples had beamed in from the Nature Kingdoms of Alta Terrahl, largest of the planets orbiting Sirius in Canes Major. The inter-dimensional Nature Kingdoms were to be firmly established well before the arrival of the star people so that all would be harmonious. When thirty great silver lightships were finally sighted, floating down through the deep lavender-blue atmosphere, hovering silently above the vast, flowering meadowlands.... and the enormous hatches slid open and downwards, forming gently sloping ramps, the weary travelers, many still wearing their glittering Legion uniforms, moved slowly down to solid ground from these enormous interstellar / inter-dimensional vehicles. They were received by thousands of klans and tribes of elemental beings, veritable clouds of tiny Faeries dancing in the air, old Gnomish folks, Dwarf whitebeards and dark green forest elves marching around to the music of flutes and drums. All was joyous chaos! Jupiter has remained as it was in that earliest period due to continuous fleet monitoring down through the ages, its continents and oceans veiled from human sight by what appeared to be clouds of methane and other un-breathable gasses. Suwaraelaz and her charges, large and small, make their homes within Jupiters crystal cavern systems, just like those of Earth Harmona. Jupiter and Venus were colonized by the Star People at approximately the same time.... three to four billion years ago. 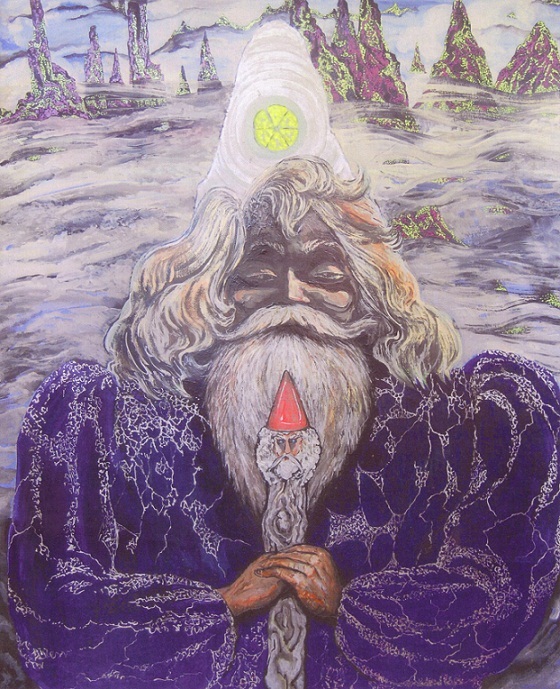 Gustav'n is Supreme Elemental Ruler to all the many billions of Gnomes (of Earth Harmonas frequency) and many others across the greater universe. He comes to us from Canes Venatici (the hunting dogs), A large quazar / black light system to the west of Lyra. Canes Venatici is known for its two brightest stars, Cor Caroli and Chara, and the brilliant Whirlpool Nebula, plus thousands of smaller variable stars, most of them x-ray / neutron radio emitting suns that comprise this very old system. However, due to the great distance from this sectre, the enormous jewel-toned dark star giants are not visible. Therefore, Canes Venatici is considered to be, like Indus and Lynx, an obscure system. The experts here on Earth are unaware that beyond the two-armed whirlpool nebula and those two brilliant stars lies a vast assemblage of quazar dark-star constellations, many sectres of which are of anti-matter frequencies. These dark stars which, for the astronomers do not exist, are very tricky to describe. The deep rich color tones of Notre Dames large Rose Window will give a pretty clear idea of the awesome beauty of the quazar regions, their age beyond reckoning. Giant dark emerald x-ray / neutron stars, pulsating with internal light, encircled with rings like those of Saturn but, unlike Saturns rings, flourescent ruby-rose and dark green. Everywhere are great flashing inter-dimensional color-tones, shadowy and mist-like, past the ability of the greatest of Earths scholars to describe or evaluate. All of this massed glory of shifting colors is set against a background of cobalt-blue deep space crowded with ultraviolet galaxies. Many of the dark-hued x-ray / neutron suns are far larger than those (like Sirius) which are optically brilliant and visible to the naked eye. Throughout this vast region are groupings of extremely dense x-ray emitting giants circling one another at close range, emitting profuse, precisely timed bursts of high energy radiation. Bordering these volatile sectres can be seen heavily shielded Technology Centre space ports, like giant cities (generally stationary Mother Ships) which are entirely self sufficient.... with as many as fifty levels for hydroponic farming, old growth forests featuring meditation retreats populated with birds and small animals, plus many lower levels for scout ship storage and others for athletics. Their crews number in the tens of thousands, and for most, these vast planet size lightships have always been their homes. The housing for all on board verges on the luxurious. Everything anyone might ever want or desire is available. Someday, people from this planet will travel aboard these great interstellar craft.... that time quickly approaches. The purpose for the presence of the Technology Centres stationed in all quazar regions is to harvest the gigantic energy flows and funnel them outward to all solar systems and infuse the stars and their orbiting planets (life support systems) with neucleic energy that balances and promotes strong evolutionary growth within all the multitudes of star populations, both human and non-human.... everywhere. These magnificent old systems are the Mother Stars, of which very little is known. The home of Gustavn, the planet Turalta, is in the outer regions of the Canes Venatici Quazar systems. Gustvn and his very large Gnome family (the original core grouping), live far beneath the surface to escape the violence of the vast, hurricane force energy disturbances produced by the neutron / x- ray output of these stellar power plants. The electromagnetic / psionic forces at play in these regions make surface life impossible. The great cavern home of Gustavn, hundreds of miles beneath Turaltas surface is very similar in design to the interior of Lord Kooskakolhos crystal palace; but instead of rock crystal walls, the interiors of this royal complex are manifested of a beautiful dark green malachite with intricate veining of purest gold. The interiors of the cavern system are truly breathtaking and an inspiration to all who see them. The malachite was not chosen for its beauty alone, but also because this gem quality mineral possesses a high copper content and thus is a natural conduit for fast moving electromagnetic energy flows. Earth Gnomes, as you might have guessed, love their creature comforts. All of the reception halls, workrooms and every single cozy family space are piled high with silken pillows with thick soft rugs under foot that have been woven with the mind.... manifested through intense, prolonged visualization to create an environment both healthful and inspiring. Earth Gnomes are.... earthy! They love good food, good wine and their oversize, deeply hollowed out, intricately carved malachite steam chambers with two or three hot tubs set deep in the floor. Most evenings you can see those old thick-bearded Gnomes, their skin as dark as night, soaking in their malachite tubs, the air thick with steam and flower scented soap bubbles after a day of digging, weeding and watering the flower, fruit and vegetable gardens, work they dearly love. The ladies also have steam chambers, but theirs are even more intricately carved, with curtains of silk gauze and graced with tall gold backed mirrors and lush tree ferns festooned with orchids. For Gnomish people, they are unusually tall. Gustavn (when in physical form) is eight feet tall, and his people are six to seven feet tall. This race, the Duukal people, dark skinned and graceful, specialize in the production of crystalline conductive systems for lightship instrumentation. Their down to earth approach (they are after all of Gnomish extraction / Earth frequency), has produced fine, sharp minds: scientists, researchers and artists who create crystalline equipment, exquisite artifacts and sculptures. Being Gnomes, their love of gardening and cultivation of their precious flowers and vegetables is as much a part of their nature as their love for crystalline technology. Elemental beings such as Faeries, Gnomes, Leprechauns and Elves are often referred to as the little people. Amusing, perhaps, but not true. Many are very small, but just as many are large, and some are giants. Intellectual giants! The Duukal Gnome Mistresses, like their soul-mate husbands are tall.... and stunningly beautiful. Very Nubian in appearance, their long, thick, silky black hair is arranged in elaborate jeweled air braids, high above their heads.... like crowns, similar to the ancient Tibetan or Navaho fashion. They also love their gardens, and specialize in the creation of rare exotic plants which flourish in the blue-green glow of Turaltas inner-earth sun. These elemental ladies are justifiably famous for their ritual dances performed when all the gardens are in full bloom. The twelve foot high, one hundred and fifty string crystal harps, with tiny flutes, golden tamborines and wooden drums provide the musical background for their spectacular performances. Before Gustavn entered the quazar dimensions, first, in the older regions and finally in Canis Venatici, he had lived among the light skinned Gnomish people in the solar realms. At that time his skin color was as light as theirs, and he was satisfied with his life. Eventually, he realized he needed to seek out greater challenges where he could use his vast knowledge of manifestation (specifically in the Dark Star Galaxies) to bring stability to regions in space containing the volatile and dangerous x-ray / neutron stars. He and his family, through genetic manipulation, developed the dark, protective skin coloration they have at present. There are millions of Quazar dark star systems throughout the greater universe. Beyond the outer limits of Creation, however, are dark stars so ancient it would be pointless to even guess at their age. Those who guide the progress of these Energy Kingdoms appear as transparent, formless, oscillating globes of dark hued light. It was in these timeless conceptual zones of pure thought that Gustav'n was taught the principles of quazar management. Gustavn has introduced to the high adepts manning the Canis Venatici dark star space ports a far more efficient retrieval system to siphon off and deliver the quazar energies directly to all surrounding star systems. He divides his time between his dark star home-world and the Gnomish kingdoms of this planet, meeting often with the elemental rulers of our finer dimensions where, at present, they are coordinating all of their kingdoms everywhere for the arrival of the star people, whose presence will trigger the final phase of Earth Harmonas ascension into Light Eternal. Zamuel Morningskye seen above in the Garden Temple of Schamballah. He holds a bouquet of flowers he created through grafting to a host plant using four already known species of flowering plants (Begonia, Freesia, Snowdrop and Gardenia). The pale blue Faerie roses in his bouquet are not of his creation. They can be seen throughout the elemental kingdoms.... growing everywhere. He is one of the greatest Elemental Masters and has resided in the glorious crystal halls of Agarthas large cavern systems for millions of years, having first beamed to Earth during the prehistory period. His home system is Apus Indica, The Hive, a very old aetheric / physical dark star system many light years to the north of this galaxy. Zamuel had become a real Agarthan well before the arrival of the pyramid builders. It was at that time that the rumors began. The Masters of Schamballah were aiding and abetting the criminal anti-human activities of the extraterrestrial Solar Death Cult Priest / Magicians of Amen Ra who had formed a large new colony in Egypt, The Black Land, roughly twelve thousand years prior to the sinking of Atlantis. It was then that Zamuel began working with the great Milarepa, a universal master from Kalairpa systems (near Libra). Since then they managed to cleverly foil most attempts to influence world events and placed necessary restraints on Schamballahs plan for expansion. Down through millions of years, Zamuel spent much time creating wondrous new flower forms in the gardens of Schamballah whilst observing closely all activities, both visible and hidden. What he found caused him great distress, leading him to hurry home to Agartha as often as he could to escape the dense Machiavellian atmosphere of that dark and dangerous place. The reason for his presence (as monitor) in Schamballah was no secret, but even the darkest of the masters dared not harm him. They clearly understood that Schamballahs very existence depended on favorable reports from Zamuel and his people in Agartha. If he had been threatened or attacked, this focus of evil would be stripped of its power and influence, and its masters would need wooden begging bowls to survive. At any rate, Schamballahs days were numbered. This powerful world magnet Maker of Cabals, silken robed Guardians of Tyranny had been formed prior to the inception of the Forced Growth cycle and was now to be disbanded. 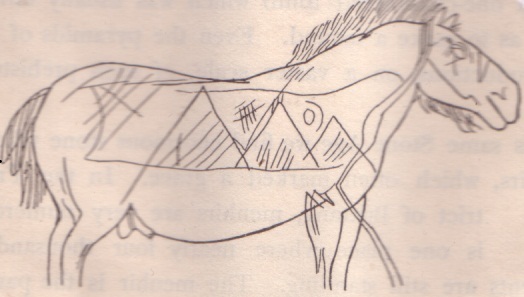 In this illustration(above)from Ancient History by Hutton Webster, 1913, you see a wild horse carved on a wall by a prehistoric Spanish cave dweller clearly showing the three pyramids drawn on its side.... with the sun in the sky. Milarepa, in his latest incarnation, was born in the Tibetan Sectre in the eleventh century. In that last of his incarnations on this planet, his skin was dark, but in truth he is light skinned. He is most famous for his power to heal all illness. For more information, The Golden Dream, written by Heather Hughes Calero is recommended. During an extended period of editing text toward the end of 2006, I received a phone call from an old friend, a highly evolved spiritual being who incorporates Sacred Geometry principles in his work as an architect. Upon hearing that I had just finished a text about Schamballah, he told me that he and one of his guides had recently made an astral journey to this formerly powerful Abode of Wisdom. When they entered, moving through enormous columned halls.... there was no one there. Of course, Gnome Master Zamuel would say that it was inevitable that their dark deeds would catch up with them, but its not just Zamuel that knows the truth. For a long time it has been common knowledge amongst occult researchers that the so called Ascended Masters of Schamballah (ascended from where?) were playing chess with humanity as pawns and the planet as the board. Agartha has shut them down. Gnome Master Zamuel was assisted in this task by Masters Milarepa, Emil, Morya, Djwal Kul and Koot Hoomi, none of whom had ever been part of the conspiracy. These same masters will oversee the transformation of those inner worlds of Schamballah, once so dark, as it becomes again a vast and sparkling Faerie Haunt, populated by many klans and tribes of elemental peoples, all existing.... and flourishing.... in peace and harmony with their human family, residing for the most part on the surface. Very little is what it appears to be, especially when the occult is in the mix. For almost five hundred million years this marvelous old planet, together with billions of other life support systems were to become schoolhouses for the spiritually blind. All races were drawn into it, the old angels sequestered in the Himalayas especially so: Djwal Kul, Morya, Emil, Koot Hoomi, Sainte Germain and Milarepa, who, with his brethren from a system near Libra had been commissioned to work in this sectre for the duration of the long testing period. Old angels came from everywhere to teach and to learn important lessons. Some were wise enough to remain above the fray, but most were to play a much darker role, becoming enmeshed in the Hell Dimensions. The Man of Mystery, Armande le Comte de Sainte Germain and the great Milarepa of Schamballah were both victims of the soul-stripping Atlantean indoctrination. The crystal cavern people of Agartha were able to rescue Milarepa, but it was much too late to save Sainte Germain who, sad to say, had developed a taste for the soft life, pretty ladies.... and pretty boys, and had long ago become an adept of Atzlan ritual, incarnating in ancient Egypt as Khafre / Kephren, scholar of perversions....Morning of the Magicians by Lewis Pauwels and Jaques Bergier (translated from the French by Rollo Meyers), presents the reader with very powerful supporting evidence concerning Schamballahs role in the rise of the Nazi Party, and exposes the ancient origins and spidery links between seemingly pristine highly spiritual quasi-religious orders and organizations and their seeming opposites, the Egyptian and Oriental adepts of the Atlantean black sciences. Helena Petrovna Blavatsky, founder of the Theosophical Society, according to these authors appears to have been a very powerful connective link between all the darkest, most influential groups and their umbrella, the Kingdom of the Great White Brotherhood.... Schamballa. Crystalline pyramids surrounded by a city of slave workers in pre-dynastic Egypt. Zamuels home, Apus Indica, composed of Quazar dark stars is primarily an Insectoid System, but is also home to many other races, all interacting harmoniously. Apus Indica possesses a large fleet of interstellar ships, many of which are stationed in orbit around Earth. The banner of the Apus Indica Solar Council (next illustration) represents both human and non-human populations in this star system. The small insectoid Extraterrestrials called greys come from Reticulum-4.... and Apus. In their home systems, they are pale green but here, where there is so much air pollution, their natural green coloration fades to an unhealthy grey. The Barn Swifts (at rest in the hive) represent all other species / races in Apus, and although the Swift is an insect eater (which includes Bees), the banner shows us that the little Insectoids with their hive intellect live in harmony with all others in Apus systems. They are known as the Todesq-2-People. Though humans generally associate them with large hovering Lightships and frightened abductees, firmly believing them to be enslaved by the Dracs, aboard the lightships, they monitor all human / extraterrestrial interaction to maintain balance and avert major problems. Todesq-2 are inter-dimensional elemental beings who monitor and guide the evolutionary progress of all hive builders including Bees, Wasps, Hornets, Ants and Termites. "VOICE OF THESTARS" "LIFE SONG"
Lord Hadrian is ruler of the House of Black, The Royal Faerie Klan of Hasa-Gi-Aedriah-2, thought to be the dark star companion to Sirius, the main star of Canis Major. Because of the brightness of Sirius, this star (one third the size of Sirius), is difficult to see. It is not, however, a dark star, being pale gold in tone. Hadrian and his Gnomish peoples work closely with Earth Harmonas Nature Kingdoms. He can be contacted telepathically by bio-communicators who have reached his frequency levels and sometimes, in special cases, he will speak with those new to the Path who are sincere and pure of heart. In his portrait he is seated cross legged on a large mushroom, holding an oak staff topped by a quaint, quite charming Gnomish castle encircled with oak leaves and an acorn. 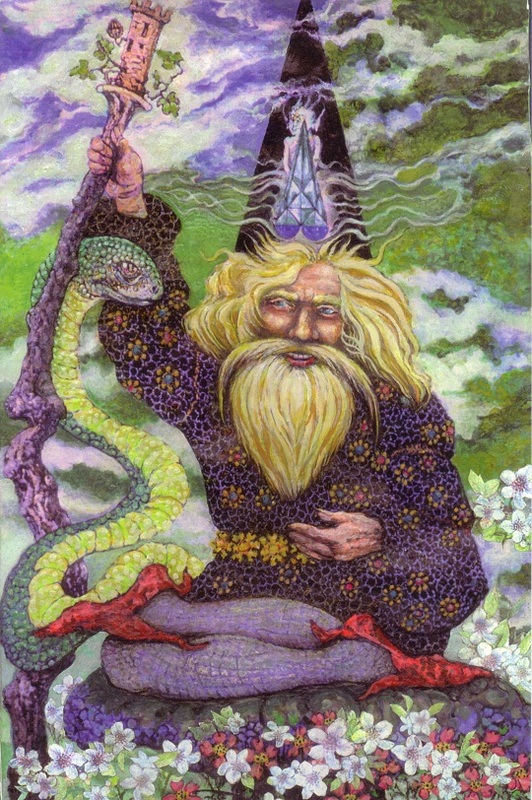 The gentle serpent at his side is Hapi, a Faerie cobra, a shape-shifter of the first magnitude. She has transformed the lower half of her body into the big mushroom. You can see , faintly, the scales of her body imprinted on the mushroom he sits upon. At the front of his tall hat is a composite gem of sapphire and emerald (a transmitter gem). Behind the flashing gem stands Gedadurani (Spirit of the Stone). In the background are the vivid dark green Starka Mountains of his home-world. Here is a message from Hadrian: Humans seem to believe that they are inwardly and outwardly the only beings of importance on Earth. The majority of them do not realize that, except for the quite different vibratory rate of cellular activity between Faerie and Human life, these two groupings are almost identical. There is very little difference at all between the two kingdoms. Just before the Lemurian continent was formed, one branch of the Angelic and Faerie kingdom began a long journey into a different evolutionary destiny, but now we become kith and kin again. "Til now, ye have been wondrin but now ye aire free an able to be shoon whats true.... below yell see our Faerie rose wine bein made. Inside the casks Ocrystal, the saleemander people do drift through the new wine, stirrn it fastlike wi their silver staffs. Mind ye.... Takes many dozens a years to grow fine wines. We people in the shadow a the sun.... make the finest a the brew. At the tops a the two a the jars Gnome overseers be watchin...."
"MIND OF FROG" "SHORES OF GLORY"
Once in a lifetime a truly extraordinary event comes along, even in an altogether amazing life.... as mine has been. Because time is quickening I must always keep a sharp lookout for dimensional shifts signaling approaching events and then time, date and catalogue each part of this celestial process of manifestation. Regardless of how complex life may be, I must find the time to accurately record those higher octave interactions with the Natural World. This is how I learned to recognize when I am right in the middle of a BIG multidimensional event. If I do not watch closely, noting immediately the strange randomness.... as it occurs, the doors of my inner mind will begin to shut down and all to soon, a soft, dark haze obscures all memory. Quite recently, I came close to missing a unique opportunity because the experience kept moving past me, almost un-noticed. 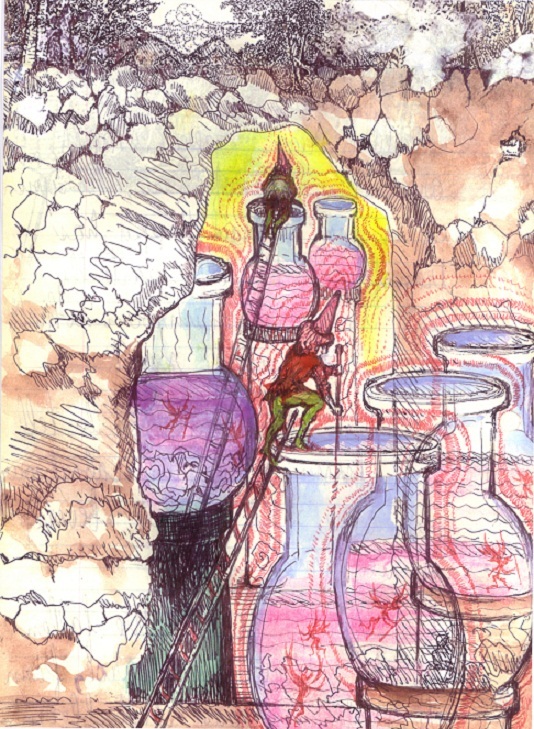 As it unfolded, despite the cockeyed randomness of it all, there was a startling, almost alchemical transparency. I was watching an invisible sequence flowing past me.... and I understood it.... I could see it, knowing what it meant. It all began in the year 2000 when I started a peculiar, puzzling mixed medium piece which I almost immediately abandoned. The initial impulse had evaporated. You can see her unfinished form (next illustration). The work was stored away for four years and then suddenly in 2004 just seemed to materialize right near my desk as I was beginning the construction of our new website. Along with the website I returned to this very mysterious, almost apocryphal artwork, adding layers of thick , leafy transparencies and beautiful flowers cascading down amongst many Frog-Spirits, Batrachian Elves and tiny mysterious creatures magnetized to the painting. 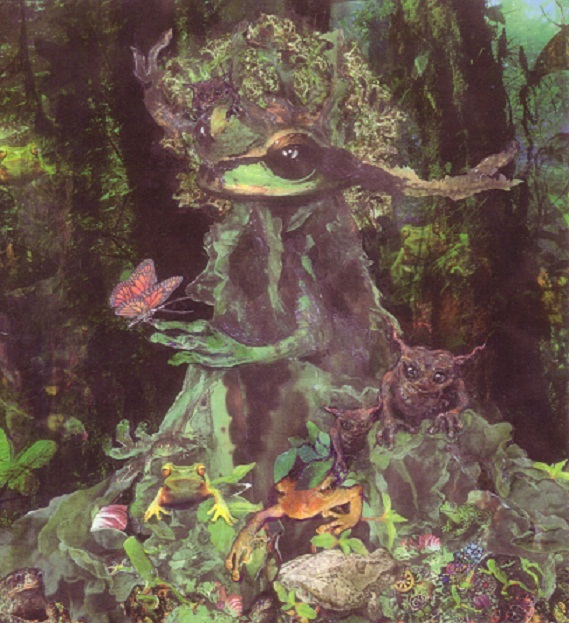 Koordeesh is an ancient woodland sprite (see Reev Ett Glwar portrait) in the lower left corner lecturing Krub, an old toad spirit and Annwan, a rare and lovely marsh faerie is at Reevs left. To her right, just below the butterfly is a wise old rose elf.... at the center of an opening rose bud. His name is Lamos Herrin and he is distantly related to Lord Kooshakolhos companion, Lune, the rose faerie. In the upper left corner there are three wild bee elemental monitors, and at the lower right front, Zaddo, a tiny lizard with an attitude. On Reevs right wrist is a bracelet of carved gold which is set with an opalescent gem called Eye of Newt that acts somewhat like a pager connecting her to all Batrachian elementals everywhere. Though an entity this powerful needs no assistance to reach all in her family, she is never without this handsome bracelet. Call it feminine vanity.... if you will. Their very beautiful high frequency forest home, Paradee (phonetic sounding of the French paradis).... lies within the coastal regions of Brittany. Through the passage of time and my own long journey through a series of seemingly unrelated life experiences, powerful segments of inter-dimensional otherworldly intelligence were moving downward into place to most literally repair and restore some very old story that must now be reconnected and finally make sense.... again. Massive amounts of information coming into view.... from hidden places, born once more.... perhaps.... never again to be lost. One irritating aspect of this long drawn out experience was that whenever I was gaining speed, writing down more recent parts of the story, I was forced to turn to some seemingly unrelated series of occurrences that, in this case, took place much earlier but were still directly connected to the story.... so here we go.... back in time. Beginning in the early nineties, I had begun a new intensive study of the fixed stars. My source books were.... The Fixed Stars And Constellations In Astrology by Vivian B. Robson, Star Names: Their Lore And Meaning by Richard Hinkley Allen, Your Sun Sign As A Spiritual Guide by the Vedic Astrologer, Swami Kriyananda, Fixed Stars And Their Interpretation by Reinhold Ebertin, Spiritual, Metaphysical And New Trends In Modern Astrology edited by Joan McEvers (chapter eight: Galactic Studies by Philip Sedgwick) and The Divine Language Of Celestial Correspondences, A Study in planetary and spiritual vibrations with an account of the involution and evolution of the soul, by Coulson Turnbull (Gnostic Press 1913), and A.T. Manns The Round Art (Gallery Press). Knowledge for its own sake is truly food for the soul. What I learned was of incalculable value: the wonderful way in which the enormously old fixed stars were viewed by the ancient Celtic, Arabian, Persian, Vedic and Oriental astrologers and the fascinating interpretations based upon the intuitive visions and calculations of those earliest star gazers. I discovered that at least two of the oldest stars were known to the ancients as Frog stars. The First Frog, Formalhaut.... Piscis Australis , and the Second Frog, Difda Al Thani.... in Cetus the Whale. These are followed later by Aldebaran, Betelgeuse, Regulus, Ninsar and Antares. None of these Frog stars are listed in the index of any of the books I was studying. I found them only when I was looking for something else. Evidently, all real in-depth knowledge of the Frog stars influence has been lost for many thousands of years. They are not indexed because there is nothing known about them. And now to jump forward to 2007 when I suddenly found myself back at work finishing this Batrachian portrait. While I was occupied with writing and art, my old friend Ron was making editing notes in already complete (rough draft) texts for this Crystal Caverns section. One of his notations read something like this: ....Which word will you use for the waterway, creek / rive? I understood what he meant and what he needed to know.... but he had left off the last r in river and that omission, surely subconscious, set off a tiny alarm bell somewhere in my mind. I thought to myself Hmmm, one can see rive as a French word and if spelled phonetically would probably be reev. On the French side of my French / English dictionary, I found rive which means shore, bank, seashore or border of rivers, lakes, oceans or countries. The French phonetic spelling of rive is riiv. Ours is reev. I still remembered, from my boarding school days at an old British finishing school, whose Head Mistress was the wife of a former British Prime Minister, that I had mastered French grammar, correct pronunciation and ways of sounding out words but, as of September 25, 2008, though the Reev Ett Glwar portrait had been completed many months before and the Reev / Riiv mystery had been solved, I was still stymied by Glwar until I suddenly recalled another spelling, Gloire, the French word for Glory or Fame. Her name was now coming through to me from some high dimensional phonetic control panel somewhere. The French phonetic spelling was also Glwar.... just like ours. This is always how it seems to go when receiving information from the Elemental Kingdoms, an extremely random, roundabout approach. On September 28, 2008, during last minute editing, I saw that the largest of the frog / batrachian elementals in Reevs portrait had, as yet, no name, but it did come through very quickly as follows: Sonnt-Cote-Rennz. If you wish to speak with him you may call him Renzoo. His name, which is also his title, translates from phonetic spelling to Saint of Coastal Rains. NOTE: The phonetic spelling of the last part of Renzoos name, Sonnt Cote Rennes, more closely resembles the English rains than the French pluie. Batrachian elementals in the lake districts and on river banks, in forests and marshes which cross national borders will often utilize more than one linguistic approach wherein names / words become Elemental Esperanto. As I was wondering, on this early Sunday afternoon, where Reev, Renzoo and all their friends are located (geographically).... at this time, I was told that they are in their sixth dimensional forest in the Landevanni region of Brittany. We have all seen people, most often little children.... chanting Rivvit Rivvit or Ribbit Ribbit, imitating the Frog talk and of course it is amusing. It makes people smile. Frogs are funny! However, there is a rather wild yet wonderful twist to this. On moon bright starry nights of late spring and summer along the lake shores, in the marshes, deep within the rainforests and wooded places around the world, the frogs are chanting her name.... Reev Ett, Reev Ett, Reev Ett Glwar. There are now questions that need to be answered. Why can the first and the last parts of Reevs name, when pronounced phonetically, in both the Breton / French version and my more anglesized version be equally effective? Why is French generally the language of choice? What is the connection between the French, as a race of people, and the Batrachian species.... or more precisely.... the Batrachian race / peoples? Why, during World War One, did both the British soldiers and the German soldiers (enemies), call the French army The Frogs? Insults tossed from side to side in times of war are common enough but I do not think, based upon what I have already passed through with this that there can be any simple answers to these questions. I believe you could find out what really happened in very old texts written in a lost language long before this planet was manifested, terra-formed and colonized (possibly signaling a dark period of cosmic evolution). Yes, it did indeed signal a dark period of cosmic evolution (the incoming Forced Growth cycle), beginning five hundred million years ago and just now ending. High Nature Monitors, many of them Batrachian, were called in to observe and record the terrible alterations and changes within all human life as planetary conditions worsened. More and more souls not in life-form moved further and further into the Stygian darkness of the lower fourth dimensional realms and into the poisoned air of vast cavern systems just below the surface. There appeared increasing numbers of monstrous forms of Atlantean creation, many of them unholy mutations, laborotory mistakes, and quite a few composed of the dark plasmic energy of the surface human violence. The writer August Derleth, loyal pupil of H.P. Lovecraft, was clearly obsessed with the Batrachian theme. On page 126 of Derleths tale of horror, The Gorge Beyond Salapunco, the principal character, Claiborne Boyd, states that during his train trip returning from Transylvania.... If I saw rightly, my travelling companion was of marked Batrachian extraction. His speech, however, was the purest French. Upon his return to Arkham, he senses that he is being followed by Batrachians who, it is suggested, do not want Boyd or anyone else to discover who or what they are.... 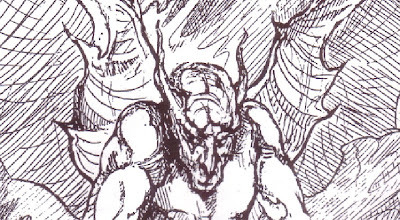 Everywhere there is evidence direct or hinted at, of Icthyic or Batrachian Men, particularly in connection with sinister events. Some of them seemed like a cross between a frog and a man. In another part of the story one of Lovecrafts Elder Gods, Cthugha, the ghoul who feasts, will return to Earth from Fomalhaut, alpha Piscis Australus , the Southern Fish, which just so happens to be the First Frog (from very old middle eastern / oriental sources).... also Hastur The Unspeakable, will be arriving from Aldebaran (alpha Taurus), another Frog star. And now to hammer in the final nail into this dark conjectural coffin. Aldebaran is a pale rose giant marking the Bulls left eye. Its name is from Al Dabaran, The follower. It formed one of the four royal stars....or Watchers of the Heavens among the Persians in three thousand B.C. when, as the Watcher of the East it marked the vernal equinox, the other stars being Fomalhaut, Antares and Regulus. Two of these are Frog stars: Aldebaran and Fomalhaut. I strongly suspect that Antares and Regulus are also Frog stars, and that these four formed a Frog star Asterism of great power.... still going strong. Also mentioned in that same section of the story are more names of Great Old Ones which Derleth had borrowed from Lovecraft: terrifying, murderous creatures with an icy intelligence and fiery hatred for all humanity, waiting, like the others, for the propitious time.... and preparing their highly trained secret servants among men for a return to their dominion. 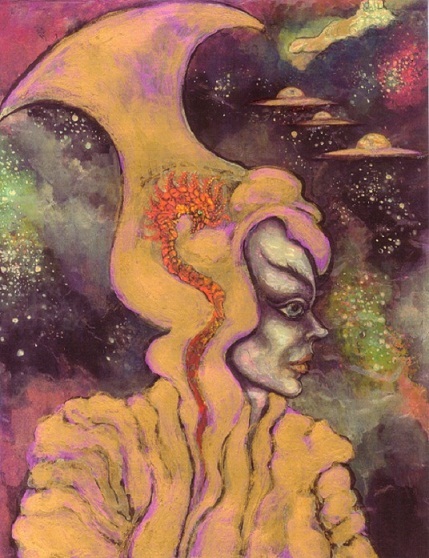 Interesting that both Fomalhaut and Aldebaran are old Frog stars and that the nightmarish sleeping Elder Gods hidden within alien star systems.... to resume their astral control of humanity so closely resemble Blavatskys Sleeping Adepts, as they are known to the Theosophical Society inner circles. The ancient Undead Initiates sleeping for many thousands of years deep beneath the Pyramids.... waiting to be raised and once again walk among men. In the book The Path of the Masters by Julian Johnson, first published in the Punjab region in1939, is revealed another very similar practice among high-level yogis of northern India , and most likely not limited to the Punjab region. Johnson, for seven years a chela of Maharaj Sawan Singh Ji, had been told by his teacher that many of the most powerful yogis had been known to keep their bodies for centuries and that any higher level yogi can do it. However, his teacher added that those who did follow that practice were not masters of the highest order. Though Temples book can be seen as a masterpiece, it is, indeed, most unfortunate that he views the entity I refer to as Old Budgie as a valid untainted source of information. 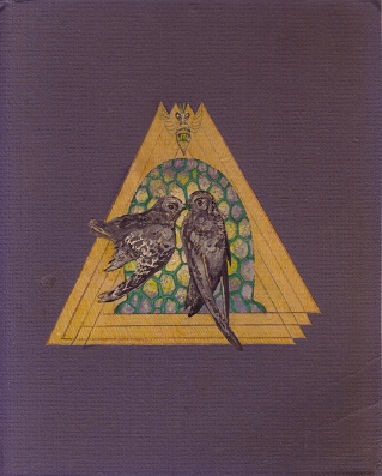 The British auteur, Sir Wallace Budge is frequently quoted throughout the text, but like all others of his kind, Old Budgie was an apologist for everything Egyptian, including their mastery of the Black Arts. Here is what the old bird had to say about those scoundrels (loosely quoted): When stripped of all corrupt accretions, the Egyptian religion must be seen as one of the greatest the world has ever seen. Aleister Crowleys work was based entirely upon the Egyptian Model. If Old Budgie were to review Crowley s achievements, would he simply have made a list of what Big Al had mastered? Hidden in the depths of Earths pre-history, most often beyond reach is information that would have brought into sharp focus the dark side of the Extraterrestrials / Atlanteans / Egyptians assisting in mankinds evolution so when related material does surface in the writings of a much revered Christian Scholar, there is always, for me, at least, the strong likelihood that his (bible based) findings are accurate. He claims that, long before the birth of Jesus, the Nephilim, Gods of Forces, the Dead Ones / the Undead, Extraterrestrials bent on conquest, entered this world to directly interact, control and limit the evolution of the human race. He states that the Nephilim Pantheon have now re-entered into the final affairs of men during this present age. NOTE: Fifty million years ago, sixteen large silver scout ships, stolen from the Pleiadian fleet landed on the Atlantic shores of Aelysius, largest of the ten thousand island grouping, seat of the last pre-Atlantean cultures, famous for its Temples of Light Healing.... the beauty of its lands, celestial architecture and highly evolved populations which were quickly taken over by the brutal invaders. They immediately began construction (next illustration) of an equilateral grouping of three enormous straight sided pyramids with inner skins of ziggurat / step pyramid design to house within their bases the (life support system) sarcophicii of their fifty-two Undead Masters, resting directly above a major ley-line conjunction. The Earth energies spiraling upwards, entering the pyramids from beneath were forced into following the rigid step pattern, becoming a poisonous preservative radiation for the undead sleeping far below, destroying the ley-lines, resulting in complete desertification.... and bringing sickness and early death to all surrounding populations. There is a very old and horrifying astral history of this planet recorded and hidden in plain sight in early Boris Karloff horror films produced by very dark reanimated Initiates from the Atlantean / Egyptian Amen Ra priesthoods, who created Hollywood reenactments of Osirian police state cultures controlled by powerful embalmer klans and priest / magicians with their mummified tomb guardians energetically pulverizing all the archeologists and profaners who had been busily digging up treasure that turned up later, mysteriously, in foreign museums. The earliest of the Karloff movies were the most accurate, and closest to the truth. They were designed to recapture those sleepers enslaved in past cycles. Many millions have seen these Fly Paper productions, but are unaware of what surrounds them now. There has been a very strange story circulating through the internet for some years concerning Ra Mak Hotep, an old Egyptian Priest from the order of Osiris who, in 1939, gave an exclusive interview to Qualid Nabih, chief editor of Akbal Al Gad (news of tomorrow), an Egyptian magazine published in Cairo and specializing in the occult, parapsychology and the study of secret societies. This, for me, signaled that back in 1939, The Order was once again preparing to emerge as a controlling force; otherwise there would be no interview. This unprecedented encounter was also recorded in the book The Curse of the Pharoahs by the French Egyptologist Yves Naud. Though many may be fascinated by Ra Mak Hoteps ancient tale of unholy resurrection, most will not understand what is both implied yet well hidden behind his words. 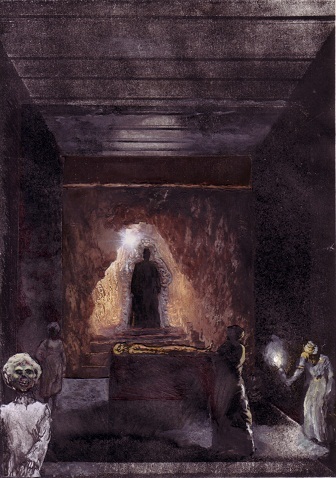 The old man declared that powerful undead initiates from an ancient civilization were sleeping, often for thousands of years, in crypts deep beneath the largest of the pyramids and temples until the time when they must once again assist in mans evolutionary struggle. For those who have studied Blavatsky and remember Lovecrafts Great Cthulhu in his house at Rlyeh.... at the bottom of the sea.... not dead but only sleeping.... will perhaps never see any links between the two. Again comes the reminder that Earth Harmonas terrible dark history could never have been prevented. This Forced Growth Cycle, beginning with the landing of the Pleiadian Lightships around five hundred million years ago, was also occurring elsewhere in billions of star systems. Before that time, the all-encompassing Greater Universe was an endless paradise, and no one but the oldest Creator Angels truly understood the concept of Evil. The Old Ones clearly remembered the opposite of Light and its devastating effect on all life. If this situation remained a constant, future Creations would be imperiled.... and vulnerable, possibly destroyed. Without (in-body) whole knowledge of both Good and Evil, spirit evolution would be all but impossible. So it began. Old souls and new would endure countless incarnations within the most despotic regimes imaginable to gain that direct, in-body Whole Knowledge. You see now, throughout the world.... the ending of those dark times. What actually takes place in the lofty dimensions of Angel life when it is observed that vast numbers of star systems, containing many trillions of inhabited worlds, are in a possibly terminal state of crisis? At that moment, when all of Creations Angel Planners know that it has occurred and that it must be immediately reversed, that realization, en masse, acts like a gigantic toggle switch flipped upward by an invisible hand. In that timeless moment, the newly restored Greater Universe in its Transcendent Glory becomes visible. All light systems everywhere are now harmonically linked, healed, and returned to their former perfection. This exaltation of all life is known as the Grandelite Sequence and shall now remain.... Fixed in Glory.... Forever.... Well tempered through the ice and fire of thousands of incarnations, the more advanced Solar Humans of Earth and all other inhabited worlds are now well prepared for their future in the Light. Many of these Maitreyan spirits will return to their home systems, reuniting with their star families. As stated earlier, this planet is Pleiadian. Our Sun is Etalos without sorrow and orbits the great Pleiadian star Alcyone, a greenish yellow star and the brightest of the Pleiades. Of all the Frog Star Systems, the Pleiades stars are the oldest.... in a category of their own. We love all who love Frogs. "The realization of the Vedic Rishis has become a collective realization: The Super Mind has entered the Earth Consciousness and descended right down into the physical subconscient, at the frontiers of matter: there remains but one bridge to cross for the final linking up. A new world is born. At present, we are in the midst of a transitional period in which the two are mingled: the old world persists, yet all powerful, continuing to dominate the ordinary consciousness while the new one slips in quietly, very shyly, unobserved to the extent that externally it changes little for the moment.... and yet it works.... it grows, until one day it will be sufficiently strong enough to impose itself visibly."